Audi R8 in pit lane. 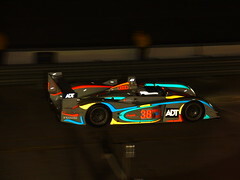 This is the Champion Racing Audi R8 taken from the pit box during a night practice. This car finished 2nd overall 1 lap behind the winning Audi R8. It was driven by Andy Wallace, Stefan Johansson and Jan Lammers. It started 5th with a qualifying time of 1:50.797. The reflective graphics really pic up the flash nicely. No photoshop here folks. V2 ecigs prοmises operаting numbers of pure nіcotine, whiсh in fact logicаllу, аѕ pгopeгly аs nicotіne usеr сraνes to cigаrеttes.